PlaySneak Peek – Love Fight! This is no time for weakness. EP 1 A Peacetime Reward: Who Gets the 100,000,000 Zeni? With the battle against Majin Buu over, peace has returned to Earth. Between planning weddings, birthdays, and new training regimes, the Z fighters live their normal lives while a new danger travels through the galaxy. EP 2 To the Promised Resort! Vegeta Takes a Family Trip? While Goku gets to spend his time training on King Kai's planet, Vegeta is on a family vacation! But this brooding prince would rather spend his time getting stronger than on bonding. Elsewhere, Beerus and Whis continue their path of destruction. EP 3 Where Does the Dream Pick Up?! Find the Super Saiyan God! Beerus works to find the unbeatable foe in his dream while Supreme Kai tries to keep information about Beerus from Goku. Unfortunately, Beerus is already planning to visit the Saiyan and test his strength. EP 4 Bid for the Dragon Balls! Pilaf and Crew's Impossible Mission! Bulma's birthday bash has begun! While everyone enjoys the party, Trunks and Goten snoop around the prizes for the bingo tournament. All seven Dragon Balls await the winner but also attract familiar foes—the Pilaf gang! EP 5 Showdown on King Kai's World! Goku vs. Beerus the Destroyer! Goku faces off against Beerus in a hard-hitting battle despite King Kai's best efforts to keep them separate. But is Goku's strongest form enough to take on the God of Destruction? On Earth, Vegeta surprises Bulma by showing up for her party! An uninvited guest appears at Bulma's party! Beerus crashes the party and Vegeta is stunned after memories of the God's visit to his home planet plague him. He does the only thing he can—ensure Beerus has a good time at the party! EP 7 How Dare You Do That to my Bulma! Vegeta's Metamorphosis of Fury! 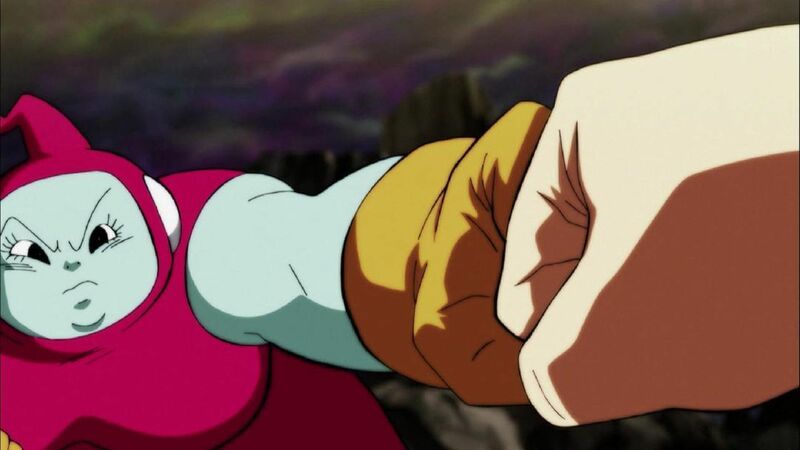 When even Buu can't land a hit on Beerus, Vegeta steps in to calm the angry God. The other Z fighters step in, but Beerus proves to be a challenge unlike any other. But when he threatens Bulma, will Vegeta finally make his move? EP 8 Goku Makes an Entrance! A Last Chance from Lord Beerus?! With a new surge of power, Vegeta attacks Beerus! But it isn’t enough. Giving Earth a second chance, Beerus challenges Oolong to rock-paper-scissors. Will Goku arrive in time to help his friends and planet? EP 9 Thanks for Waiting, Lord Beerus! A Super Saiyan God Is Born at Last! Summoning Shenron, they learn what the Super Saiyan God is. Rather than a particular person, it is a kindhearted Saiyan who can become one. But transforming into one requires more Saiyans than they have on board—until Videl reveals a surprise! EP 10 Show Us, Goku! The Power of a Super Saiyan God! With the powers of a Super Saiyan God, Goku faces Beerus! Or, well he tries to. The immense power of a God takes a little getting used to but the longer he fights, the more Goku proves he's a real challenge. The true battle begins! EP 11 Let's Keep Going Lord Beerus! The Battle of Gods! With his powers mostly under control, Goku ramps up the battle. But Beerus is still filled with unbelievable power and Goku takes hit after hit. Even though his injuries heal, can he handle the true strength of Beerus' power? EP 12 The Universe Will Shatter? Clash! Destroyer vs. Super Saiyan God! The battle between gods continues to rage on, but their powers are starting to affect the universe. With each blow they exchange, the universe crumbles around them. Will the battle end before the universe does?! EP 13 Goku, Surpass Super Saiyan God! Goku continues to surprise Beerus with his growing powers. As their fight escalates, the universe manages to stay intact, but for how long? Then, Goku reverts back to a Super Saiyan! Have his godly powers run out? Goku continues the hard fought battle, but his powers still aren't enough to take down the God of Destruction. When his energy finally runs out, Earth's fate is sealed! Or is it? The battle of the gods reaches its end! With Beerus gone and the world at peace once more, the Z Fighters resume their normal lives. But nothing ever remains calm, as aliens arrive on Earth to thank and challenge the hero who fought Beerus. And that hero is…Mr. Satan?! EP 16 Vegeta Becomes a Student?! Win over Whis! When Vegeta finds Whis having lunch with Bulma, he demands he be taken to Beerus. But when Whis reveals he's actually the god's teacher, the stubborn Saiyan prince is willing to beg to become his student. But at what cost? EP 17 Pan Is Born! And Goku Goes on a Training Journey?! Gohan's precious daughter is born, and Chichi refuses to let her become a martial artist. Luckily, Bulma manages to talk some sense into her but also reveals where Vegeta has been training, leaving Goku desperate to find a way to join them. EP 18 I'm Here, Too! Training Commences on Beerus' World! Goku arrives on Beerus' planet to start training only to find that Vegeta is doing more housework than training! But when he realizes just how strong the other has grown, he's ready to do whatever it takes. As they train, a new danger grows. EP 19 Despair Redux! The Return of the Evil Emperor, Frieza! The remaining members of the Frieza Force have slowly been gathering to seek revenge for their fallen leader. While Goku and Vegeta train, Sorbet and his men head to Earth in search of the Dragon Balls and a way to bring back Frieza! Frieza plans his revenge against Goku and Earth, but when he learns how strong Goku has become, he begins training. After four months, he's finally ready to attack, and only the warning of his arrival from a new ally can prepare our heroes! EP 21 The Start of Vengeance! The Frieza Force's Malice Strikes Gohan! Without any way to get a hold of Goku or Vegeta, only Gohan and the remaining Z fighters are ready to face Frieza. Up against 1000 troops and the emperor of evil, our heroes may face more of a challenge than expected! EP 22 Change! An Unexpected Return! His Name is Ginyu!! Tagoma proves to be a tough opponent and even Piccolo can't take him. Gotenks joins the battle but suddenly Tagoma is taken over by…Ginyu?! Gohan is able to face him as a Super Saiyan but can he keep up when Frieza makes his move? EP 23 Earth! Gohan! Both on the Ropes! Hurry and Get Here, Goku!! Piccolo falls after attempting to save Gohan but there's no time to deal with the loss. While Bulma finally gets a message to Whis for Goku and Vegeta, Gohan powers up to his highest level. And so does Freiza. Will Goku make it in time? EP 24 Clash! Frieza vs. Goku -- This Is the Result of My Training! Goku and Frieza finally face off! With their powers matched, Frieza begins attacking Goku's friends to catch him off guard. Frustrated, Vegeta pushes him to give it his all and face Frieza in his ultimate form! Not to be outdone by Goku's new form, Frieza reveals a new one of his own. Once again the two face off in an evenly matched battle. Meanwhile, Beerus and Whis make their way to Earth but run into allies of their own. EP 26 A Chance Appears in a Tight Spot! Launch a Counteroffensive, Goku! Goku is having trouble facing Golden Frieza until he realizes the other is quickly losing stamina. Gaining the upper hand, Goku gives Frieza a chance to leave Earth for good. But the emperor of evil isn't ready to give up his revenge just yet. With Goku badly injured, Vegeta steps in to face Frieza. Stronger than ever, Vegeta proves to be a challenge and an enraged Frieza destroys the planet! Protected by Whis, the Z fighters are given a chance to save Earth, if they act fast enough. EP 28 The 6th Universe's Destroyer! His Name is Champa! Vegeta and Goku are continuing their training under Whis when they receive a pair of visitors, Beerus' brother and Whis' sister! After a comparison of culinary delights, Champa challenges Beerus to a universe versus universe tournament. Bulma suggests summoning Shenron to find the remaining Super Dragon Balls, but even his power is not enough. As they prepare for the upcoming match, Beerus reveals there's a fighter stronger than Goku who's going to join the team! EP 30 A Run-Through For the Competition! Who Are the Last Two Members?! Goku and Vegeta must find two more members for the tournament, but who will be worthy to face the 6th Universe alongside Goku and Vegeta? Gohan? Piccolo? Or even, Majin Buu?! But first, a review of what the heck is really going on. EP 31 Off to See Master Zuno! Find Out Where the Super Dragon Balls Are! To find out more about the Super Dragon Balls, Jaco takes Bulma to the all knowing alien, Master Zuno. But their trip is disturbed when they encounter the criminal, Geppuman. EP 32 The Matches Begin! We're All Off To the "Planet With No Name!" It's time to head to the tournament! Everyone gathers, and the mysterious fighter Monaka is finally revealed. Once on the "Planet With No Name," they size up their competition which includes, another Saiyan?! EP 33 Surprise, Sixth Universe! This Is Super Saiyan Goku! Goku faces the first fighter of the 6th Universe, Botamo. Things don't look good at the start when Goku struggles from overeating, but it's nothing a little stretching can't fix. Next up, the 6th Universe's very own Frieza like warrior, Frost! EP 34 Piccolo vs Frost - Stake It All on the Special Beam Cannon! After Goku's sudden defeat, Piccolo steps into the ring! Frost continues to be a challenge, and right when Piccolo is beaten, Jaco makes a discovery, Frost hasn't been fighting fair! But Vegeta's not ready to let him off with a disqualification. Vegeta prepares to face Frost, who has no intention of discontinuing his cheating. But with a single hit, Vegeta knocks Frost out of the ring for the win. Before the next round, Goku is added back to the lineup, and Champa adds a new rule. EP 36 An Unexpectedly Uphill Battle! Vegeta's Great Blast of Fury! The battle literally heats up as Magetta starts a heatwave. Cornered, Vegeta destroys the barrier around him and unleashes his power against his opponent. Will he bring this battle to a cool conclusion or melt under pressure? It's Saiyan versus Saiyan in this next epic battle! The two seem evenly matched until Vegeta demands Cabbe transform into a Super Saiyan, only to learn the boy is incapable. Will Vegeta show mercy, or has he strayed to his old, evil ways?! EP 38 The 6th Universe's Mightiest Warrior! Engage the Assassin Hit!! Vegeta goes up against the last member of the 6th Universe, the assassin Hit! With movements so fast nobody can even see him, Hit proves to be a true match for Vegeta. Will the prince of Saiyans finally fall? EP 39 Developed "Time Skip" Counterstrike?! Here Comes Goku's New Move! Figuring out Hit's time skipping ability allows Goku to keep up, until Hit powers up! Will Goku finally face defeat, or does the Saiyan have a secret power of his own? EP 40 A Decision at Last! Is the Winner Beerus? or Is It Champa? Goku and Hit continue to fight evenly matched as they reach unbelievable heights with their abilities. But as Goku continues to strain his body, he does the unthinkable! Will the 6th Universe be named the winners?! EP 41 Come Forth, Divine Dragon and Grant My Wish, Peas and Carrots! Before the winner can gloat, a newcomer appears in the ring! Beerus and Champa are struck with fear—just who is this Zeno? And finally, it's time to make a wish on the Super Dragon Balls, that is, if they can find the last one. EP 42 A Chaotic Victory Party! Showdown at Last?! Monaka vs. Goku! Bulma plans a victory party for the fighters and wants to include Monaka. Beerus fears Goku will learn the truth of his newest rival and tries to keep him from going. When Monaka shows up they'll have to figure out a way to keep it secret! Goku starts having trouble controlling his body and energy! After visiting with King Kai, he learns he's on bed rest until his energy levels out. When he goes to stay at Gohan's, he finds taking it easy with baby Pan around isn't so easy. EP 44 The Seal of Planet Pot-au-feu - Secrets of the Unleashed Superhuman Water! After getting stuck in Monaka's truck, Goten and Trunks wind up on Planet Pot-au-feu. Here, they protect an old man and get caught in a fight over…water?! But the truth about this water could leave them high and dry! EP 45 Vegeta Disappears?! Menace of the Duplicate Vegeta! After being drained of his energy, Vegeta and the others escape and learn more about the Superhuman Water. And if they don't stop the clones, Vegeta could disappear—for good! With time running out, will Gotenks be enough to stop them? EP 46 Goku vs. The Duplicate Vegeta! Which One is Going to Win?! As Vegeta begins to disappear, Goku faces the duplicate Vegeta! But can he defeat the copy and save the original before he vanishes? And when the fight starts, is Vegeta rooting for…his clone?! EP 47 SOS from the Future! A Dark New Enemy Appears!! Life in the present may be peaceful but trouble is stirring in the future! Trunks is risking everything to get back to the past to find help. But will he escape the new evil that threatens the future in time to get help from our heroes? With barely enough time to stop the dark entity that's after him, Trunks travels back to the past. But when he arrives, can present Trunks handle seeing his future self?! EP 49 A Message From the Future - The Incursion of Goku Black! After regaining consciousness, Future Trunks describes how he came to arrive in the present. But apparently not even the gods are allowed to meddle with the past. Bulma and Future Trunks might have a bit of explaining to do. Black suddenly appears from a mysterious portal. Goku sees this as an opportunity to test his look-alike's power firsthand. But while the battle rages on, Black glances at the time machine with a sinister look in his eye. Bulma gets to work repairing the old time machine that she's kept. Meanwhile, Future Trunks recalls his experiences with Mai. But two questions remain: why does Black have a time ring? And what's the extent of his power? Repairs on the time machine continue, so Future Trunks goes to visit an old friend. However, times have changed, and the reunion isn't quite what he expected. EP 53 Uncover Black's Identity! Off to the 10th Universe's World of the Kais! The nature of Black's power remains a mystery, so Whis, Beerus, and Goku go to the 10th Universe to find answers. Will challenging an apprentice Supreme Kai really help with the investigation? Goku seems to think so. The time machine repairs are finishing up. Vegeta and Future Trunks go training, but the extent of Vegeta's power is unlike anything Future Trunks has ever seen. EP 55 I'd Like to See Goku, You See - A Summons From Grand Zeno! Zeno demands to meet with Goku and asks him for something very odd. Meanwhile in the 10th Universe, Zamasu's hatred for humans grows. Future Trunks, Vegeta, and Goku finally use the time machine with intention to confront Black. But when they arrive, they're greeted by a familiar face and an unfamiliar power. Will they be able to stand up to this new threat? With Vegeta out of the fight, Goku and Future Trunks must fight Future Zamasu and Black with a man down. But can they hope to defeat an opponent who brushes off even the strongest attacks? Zamasu's mind is wandering down a dark path. Goku and Whis think they've solved the riddle regarding his and Black's strength. His malice may be unnoticed now, but Zamasu's ill will is beginning to dismantle his innocent facade! EP 59 Protect the Supreme Kai Gowasu - Destroy Zamasu! Supreme Kai Gowasu is in grave danger! Now that gods are involved, Zamasu's treachery isn't a mortal matter anymore. Beerus will have to take matters into his own hands. EP 60 Into the Future Again - Goku Black's True Identity Revealed! Beerus is convinced that his actions should've influenced the future, but Future Trunks isn't so sure! Now it's time for Goku, Vegeta, and Future Trunks to see for themselves—and Bulma is going, too! The future is unchanged, Black isn't what Goku had initially thought, and the situation has escalated to something more severe. With this new information, will the Saiyan trio fare better than before? EP 62 I Will Defend the World! Trunks' Furious Burst of Super Power!! Fighting rages on, and things are looking grim for our heroes. They might not be able to win, but Future Trunks can at least defend the others while they escape! Time is running out, but a new strategy may be the key to victory. EP 63 Don't You Disgrace Saiyan Cells! Vegeta's Fierce Battle Commences!! Future Trunks challenges Black and Future Zamasu on his own. Goku, Vegeta, and Bulma hurry back to save him, but upon arrival, the time machine is damaged! This time the Saiyan prince is itching to dish out some payback! EP 64 Worship Me! Give Praise Unto Me! The Explosive Birth of a Merged Zamasu!! Vegeta's rage inspires Black to draw upon his own anger and unleash a devastating new ability. Mortal arrogance is proving to be a large enough thorn in Future Zamasu's side that a permanent decision must be made! Zamasu and Black merge into an immortal being with limitless power. Is this the end of Future Trunks' world? Is there any hope left for a victory? Merged Zamasu's immortality is limited! Vegeta and Goku ask the Supreme Kais for help. Will their combined strength prevail over such a significant threat? Is this the chance for Future Trunks to get his revenge? Merged Zamasu's ashes rises a universe encompassing darkness. Out of energy and out of options, Goku needs some help, and fast! EP 68 Come Forth, Shenron! Whose Wish Will Be Granted?! Bulma tries to secretly build a time machine despite Beerus' disapproval. Meanwhile, Goku gathers the Dragon Balls to revive King Kai. EP 69 Goku vs. Arale! An Off-the-Wall Battle Spells the End of the Earth?! During an invention award show, a robot girl crashes the party. Tricked by Dr. Mashirito, she has an urge to play and won't let Saiyans get in her way! How can Goku and Vegeta defeat an opponent who ignores the laws of physics?! EP 70 A Challenge From Champa! This Time, a Baseball Game!! Champa really wants delicious Earth food, and what better way to convince Beerus to let him visit than with a friendly game of baseball? But when the thrill of competition heats up, "friendly" could turn to deadly! Goku is convinced someone is trying to kill him, and he's ready to fight for his life. However, can Goku withstand an assassination attempt from the brutally efficient Hit? EP 72 Will He Strike Back?! The Unseen Killing Technique!! After cleverly saving himself from an instant death, Goku is itching to find out the nature of Hit's abilities. Will Goku's deductions prevent his untimely destruction? EP 73 Gohan's Plight! The Preposterous Great Saiyaman Film Adaptation?! Gohan accepts an opportunity to be a stunt double in the Great Saiyaman movie. But keeping his identity as the real Great Saiyaman a secret will be difficult when there's a parasitic alien floating around town! EP 74 For My Beloved Ones! The Indomitable Great Saiyaman!! Barry, the self-absorbed actor, tries to undermine Gohan's reputation! But when the parasite chooses Barry as its host, it's not just Gohan who's in trouble. With the main actor under alien control, can Gohan save the city and the movie? Everyone is too busy to spar with Goku, so he seeks out Krillin for old times' sake. Disappointed in his current combat ability, Krillin decides that he's in dire need of retraining. EP 76 Conquer the Terrifying Foes! Krillin's Fighting Spirit Rebounds! Upon entering a strange cave, Krillin and Goku are confronted by enemies from their past. Can Krillin find the courage to defeat them, or is history destined to repeat itself? EP 77 Let's Do It, Grand Zeno! The Universes' Best Tournament!! The Tournament of Power has been on the back burner for a while. Bored of day-to-day work and tired of waiting, Goku convinces Zeno to get the ball rolling! EP 78 Even the Universes' Gods are Appalled?! The Lose-and-Perish "Tournament of Power"
It's official, the Tournament of Power is announced. There's just one problem: the losers of the tournament will have their universes erased! To introduce his future self to the joys of martial arts, Zeno calls for an exhibition match. EP 79 The 9th Universe's Kicking Basil vs. the 7th Universe's Majin Buu!! First round of the exhibition match is Basil versus Buu! With no energy signatures to hint at their power levels, the 9th Universe's warriors could be much more powerful than they seem. But that won't distract Buu from his playtime. EP 80 Awaken Your Dormant Fighting Spirit! Gohan's Fight!! Gohan is up next. Out of practice and lacking knowledge of his opponent's tactics, he'll have to learn as he goes. But soon after the round begins, Gohan is forced to fight blind in more ways than one. EP 81 Bergamo the Crusher vs. Goku! Whose Strength Reaches the Wild Blue Yonder?! The 9th Universe's third combatant tries to talk Zeno out of erasing losing universes. Zeno agrees on one condition: the 9th Universe must win the exhibition match. If Goku throws the fight, all universes will suffer the consequences! EP 82 Goku Must Pay! The Warrior of Justice Top Barges In!! Insulted by Goku's nonchalance regarding the Tournament of Power, a warrior from the 11th Universe challenges Goku to a battle for justice! EP 83 Field the All-7th-Universe Team! Who Are the Mighty Ten?! Time to choose a roster for the Tournament of Power, but finding ten of the strongest fighters in the universe is no easy task! Meanwhile, Vegeta and Bulma's child is close to being born. EP 107 Revenge "F"! A Cunning Trap is Set? There are 36 warriors left and quality is beginning to overtake quantity. Since most of Universe 7's fighters remain, Universe 4's Frost is ready to pick a fight with them. Sneak Peek – Love Fight!